Margherita Pizza with Vegan Mozzarella Cheese That Stretches! 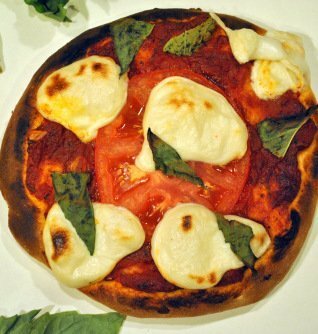 This recipe for Margherita Pizza is made from scratch using fresh vegan mozzarella cheese that browns and stretches! Even if you would rather use bottled sauce, and a pre-bought crust, whatever you do, please make Somer’s fresh ‘Moxarella’ vegan mozzarella cheese. It is so easy to make it’s nearly instant. Combine all ingredients and knead for 10 minutes. Cover and let rise in a warm place for 60 minutes until doubled. In a small saucepan sauté the garlic in the olive oil for a minute or two on medium heat. Add all the other ingredients. Reduce heat to low and let simmer while you make the Moxarella Cheese. Soak the cashews in water for several hours and then drain if you don’t have a high powered blender. 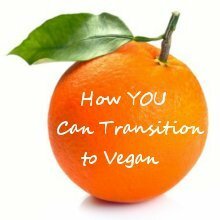 Blend all ingredients together until completely smooth (about 1 minute). Pour into a small saucepan and cook, stirring constantly over medium high heat. After a couple of minutes the mixture will start to look weird, like it’s curdling or separating. This is totally normal, reduce heat to medium and continue stirring so you don’t burn the cheese on the bottom of the pot. 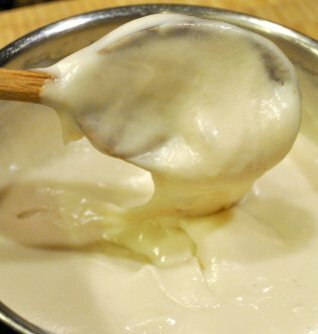 Keep cooking and stirring until really thick (about 2-3 more minutes) and the mixture becomes like a cohesive mass of melted dairy cheese and stretches like in the photo below. Remove from heat and let cool a bit while you assemble the pizzas. This cheese stays “melted” until baked, and then it forms a nice crust, like dairy cheese does. 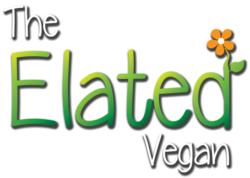 It’s not intended to be eaten plain. Moxarella stores well in a sealed container in the fridge for a few days and can be used to make excellent grilled cheese sandwiches, macaroni and cheese, etc. Your dough should have doubled by now. Punch it down and divide into four pieces. Roll out the dough on a floured surface as thin or thick as you like. We opted for thicker pizzas this round. Spread each pizza with quarter of the pizza sauce. Top with fresh tomato slices, dollops of the fresh Moxarella Cheese and fresh basil leaves. Bake individual pizzas for 10-12 minutes on a baking sheet until cheese and the crusts are nicely browned. Sprinkle pizzas with a bit of additional chopped fresh basil once out of the oven if desired. Enjoy with a large garden salad. Thank you to Somer from ‘Vedged Out‘.